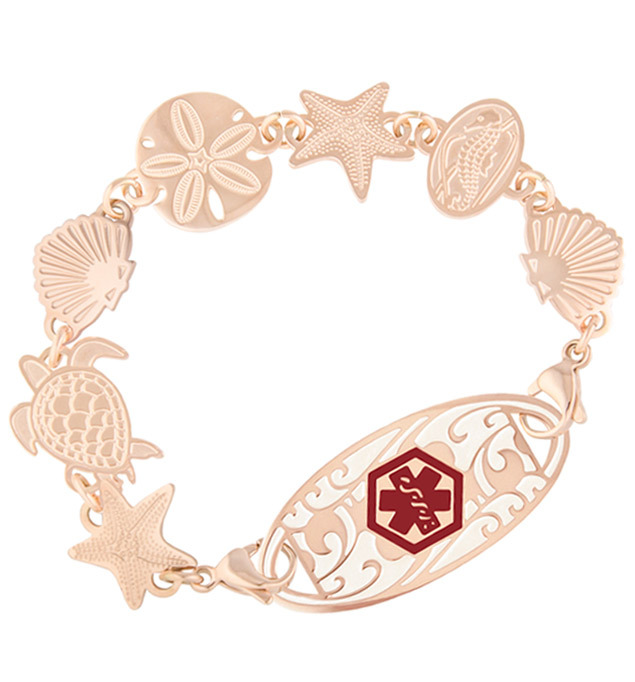 A new twist on a Lauren’s Hope customer favorite, the Rose Gold Tone Sea Life Medical ID Bracelet features the starfish, sea turtle, shell, and seahorse links of our classic Sea Life bracelet, updated to include two-sided links and a beautiful rose gold tone finish. This hypoallergenic, waterproof design pairs perfectly with your favorite rose gold tone medical ID tag for a casual, everyday look that keeps those wonderful beach day memories close to the surface every day. As with all of our interchangeable designs, you can wear your Rose Gold Sea Life Medical ID Bracelet with any custom-engraved Lauren’s Hope medical ID tag, keeping what’s truly most important to you right at hand. This on-trend med ID is a great choice whether you wear your medical alert bracelet for epilepsy, lupus, hypothyroidism, Alzheimer’s, vision impairment, or any other medical condition or treatment consideration. Custom engraving allows you to choose the look you want so you can stay safe in style.